Reminder: The BRA's public meeting is this Monday, 6:30 PM at 44 Thompson Place and the BRA will vote on the measure at their meeting on Wednesday - See this post for full details. A plan to turn five vacant Fort Point buildings into offices could face opposition from the neighborhood when it’s unveiled next week. The Boston Redevelopment Authority is brokering a compromise that would allow 56 artists to keep their leases in the South Boston district until 2010 and give developers approval for 400,000 square feet of office space, city officials confirmed. Artists at two locations face eviction Nov. 30. Under the terms of the deal, the artists would get a temporary reprieve while Lincoln Property Co. gets a green light to turn a pair of vacant warehouses at 316-322 Summer St. into office space with a rooftop addition. Additionally, Archon Group could proceed with an office project at 49-63 Melcher St. But some Fort Point residents say the plan falls short of promises for a mix of residential, commercial and park spaces. 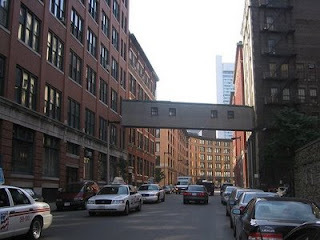 Cheryl Forte, a Fort Point Arts Community board member, praised Mayor Thomas M. Menino for negotiating on behalf of the artists. But in an e-mail, she said her group is concerned about the pairing of artist lease extensions with the approval of two developments. “I understand there are people who feel that residential should be built first, but the market no longer supports housing,” he said. A BRA hearing on the projects is set for Dec. 1. Labels: articles, development, FPAC, Melcher St., Summer St.